It wouldn’t be Thanksgiving dinner without a side of Rolls to go with your fabulous Turkey. 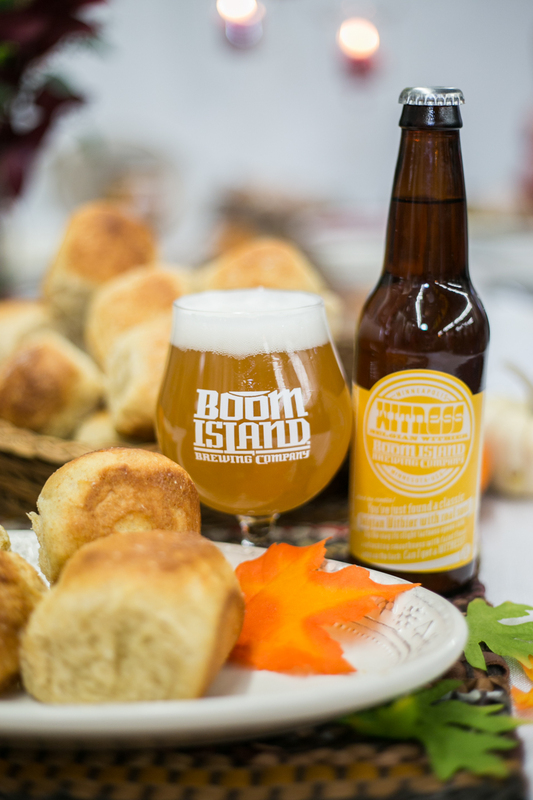 Our recipe combines the citrus flavors of Witness Wit with the light, fluffy texture of a great roll. In a medium bowl sift together the flour, salt and dry milk powder. Add the cream and the Witness, mix until just combined. Add the eggs one at a time, mixing thoroughly between additions. Add the honey and butter and stir until combined. Turn the dough out onto a clean work surface and knead for 10-12 minutes or until the dough is smooth and elastic and no longer sticky. Coat the inside of large bowl with oil. Form the dough into a ball place in the bowl. Cover the bowl tightly with plastic wrap and allow to rise in a warm room until doubled in size. Turn out the down onto a clean work surface and knead lightly for about 1 minute. Cut the dough in half, then into thirds to form 6 equal sized pieces. Cut each piece into third again to create 18 equally sized pieces. Gently roll each piece of dough, forming a smooth ball. Using two 9 x 9 inch baking dishes, arrange the rolls leaving a bit of space between each. Cover and allow to rise until about doubled in size. Combine the melted butter and honey. Brush the top of the rolls with honey butter mixture, sprinkle with salt, zest and coriander. Bake at 400 for 12-15 minutes until golden brown. Hi Ema! Our recipe-maker does not recommend adding in pistachios because it might present some texture issues. If you do want to give it a try, we always welcome feedback, so let us know what you think!